Activated charcoal has been around since the early 1900s for its medicinal properties and in recent years it has made its way into skincare. The reason is that it has adsorptive (not a typo) properties, which attracts and pulls impurities from the top layer of the skin for a deep cleanse. 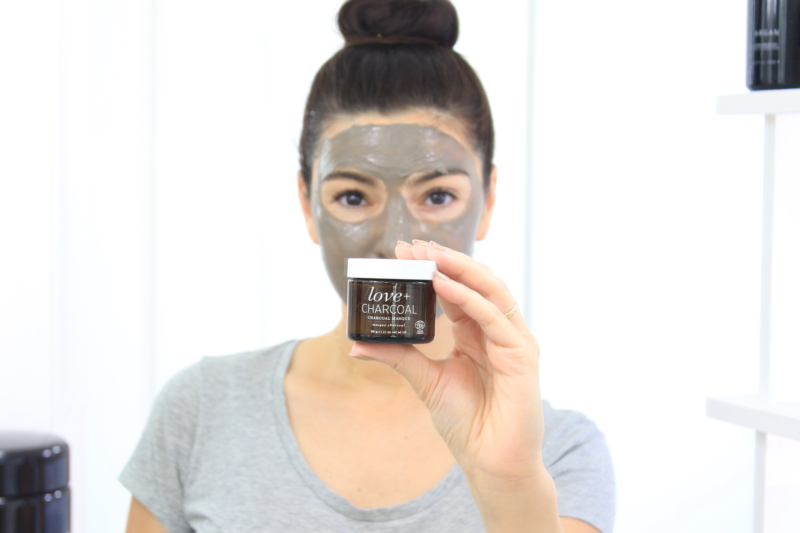 The One Love Organics love + Charcoal Masque* combines the cleansing action of activated charcoal and clay with soothing and hydrating ingredients and mild exfoliators for a satisfying, but non-stripping deep cleanse. The face mask comes in a pre-mixed formula that gets its gray tint from charcoal–no need to mix powder with water or other activating liquid. The consistency is creamy and easy to spread and feels cool upon application. It does not warm up as it sits on the skin, and I personally have not experienced any tingling with it. It is very gentle. As a confessed germophobe with no intention to recover, I like to pick up the product with a clean measuring spoon. I have figured out that 1 tablespoon gives me a generous layer of mask. I like to use a mask brush to apply it, but a clean finger can work just as well. I leave it on for about 10-15 minutes and then I removed it with the help of my favorite, non-scratchy muslin cloth by Odacité–the one that comes in the Green Ceremony Cleanser (I promise it’s not one of those evil, skin-tearing muslin cloths–it’s very soft). I just wet the cloth and gently take it all off, following with a water rinse to ensure that there is no residue left on the skin. After a few minutes the mask starts to dry, however it never really hardens to the point of becoming uncomfortable and drying. Again, it’s super gentle. You can see a video of how I use it here. 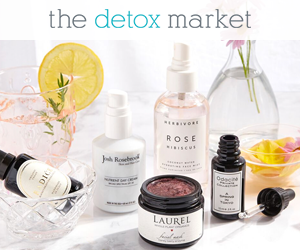 Rose kaolin is a type of clay that boosts the “purifying” properties of activated charcoal. It is a very gentle type of clay, so it suits all skin types, including the most delicate ones, while still boosting the skin’s circulation. That being said, if your skin is sensitive to a lot of ingredients, you should perform a quick sensitivity test. The love + Charcoal Masque combines the deep-cleansing properties of activated charcoal and kaolin with the soothing and moisturizing benefits of Cupuacu butter, a South American superfruit. Cupuacu is also known as Brazilian cocoa and its seeds have historically been used by the indigenous people to treat all sorts of health problems–especially to ease labor and birth pain. The butter is made by cold-pressing the seeds, which have a swoon-worthy nutritional profile. High in vitamin C, B vitamins, fatty acids, and polyphenols (including a peculiar type called theograndins). Cupuacu is considered a valuable alternative to cocoa because it has a similar antioxidant profile but not as much caffeine. An interesting study compared the phenolic and flavonoid content of cocoa and cupuacu and found that while the phenolic content of cocoa is three times higher than the cupuacu, the latter’s flavonoid content is three times higher than cocoa’s. Flavonoids are phytonutrients with extensive health benefits: antioxidant, anti-inflammatory, and much more that has yet to be studied in order to be fully understood. The butter made with cupuacu seeds is so highly emollient that it is often used as a vegan alternative to animal-derived lanolin. With a high content of oleic acid (43.9) and lower content of linoleic acid (4.60), cupuacu butter is a great moisturizing and regenerating cosmetic ingredient to look for if you have dry or mature skin. In addition to the cupuacu superfruit, the formula includes several hydrating and calming ingredients, such as aloe vera and alpine rose. Aloe vera is a well-known skin-soothing ingredient that is known to promote wound–especially burn wound healing. It is also being studied for its collagen-boosting properties that seem to promote skin’s elasticity with promising results. Alpine rose is a resilient plant that grows beautifully throughout the entire year, despite the harsh weather conditions (freezing cold and dry air) in the Alps. It has shown skin-protective properties in in-vitro studies against environmental stressors and pathogens due to its antioxidant properties. I have been using this mask a couple of times a week, alternating it with fruit enzyme-based masks, for the past three months. As someone who has delicate skin, but needs deep-cleansing a couple of times a week (at least! ), I like that this mask does the job without causing irritation, unlike many “purifying” masks. I also enjoy having the option of a pre-mixed face mask, since most of my favorite ones are powders that need to be mixed with a liquid. While I don’t mind doing the mixing, there are days when it feels great to be able to grab this mask for a quick at-home facial. It does exactly what it claims–cleanse the skin while keeping it balanced, non-stripped and instead providing emollients that leave the skin feeling rejuvenated and soft. If you have tried a bunch of disappointing, purifying masks that left your skin feeling tight and dry, I would give this one a try.